Cohesive is a leading provider of IBM Maximo Software, the most powerful Enterprise Asset Management (EAM) solution available today. Cohesive employs the largest team of industry experts and certified Maximo professionals in the enterprise asset management marketplace. Our energy, utilities, and manufacturing domain knowledge of industry leading practices enables our clients to achieve high performance reliability programs and maximize their Maximo technology investment. 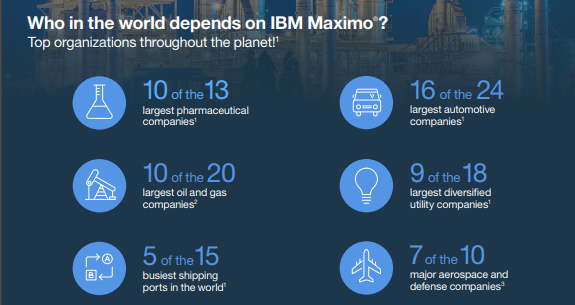 IBM Maximo Software is globally recognized as the leading EAM solution for asset intensive organizations. Inventory management – Know the details of asset related inventory and its usage including what, when, where, how many and how valuable. IBM has also developed a variety of add-on solutions for Mobility, Spatial and Linear Asset Management, Advanced Scheduling, and Health Safety & Environmental (HSE). As a leading reseller and Premier IBM Business Partner, Cohesive offers any of these additional modules on a try-and-buy basis. Maximo Linear Asset Manager extends the capabilities of the IBM enterprise asset management solution to include the management of linear assets. It enables you to change characteristics over the span of a linear asset using dynamic segmentation. A viewport in the Application Designer application indicates the amount of screen real estate available on the device for which you are designing. The Viewport domain, in the Domains application, lists the viewports that you configure for different devices. When you configure a viewport, it becomes available for selection in the Application Designer application. The Is Mobile check box in the Application Designer application specifies if an application is designed for use on a mobile device. When you check this box, the user interface becomes appropriate for a small, touch-sensitive screen device. Sample applications, Work Status (WOTRACK_EV) and Report Problem (SR_EV), are provided on the product launchpad to help you start developing applications for use on mobile devices. A sign-in screen is provided for use specifically on mobile devices. A mobile device is automatically detected if you have single sign-in (LDAP) enabled. Maximo Anywhere is designed to work in a hybrid connected and disconnected environment. Unlike Mobile and Everyplace that connect directly to Maximo, Anywhere connects through a MobileFirst server. This is a powerful tool that will allow clients to distribute applications from the MobileFirst application center, similar to the Android Play Store. The current release of Anywhere runs on Android (phone, tablet), Apple iOS (phone, tablet) and Windows 8.1. Reduce data entry errors and miscommunications by allowing users to simply do their work – even while disconnected. New features in IBM® Maximo Anywhere version 7.6.3 improve the efficiency of the installation process, the view of data in the IBM Maximo® Anywhere Work Execution app, and the ability to work offline. Improvements to the user interface, and serviceability are also included. View videos of the installation process. Specify information for push notifications support. Specify the path to the directory where you installed Oracle JDK. Select which apps to build, deploy, and distribute. Ensure, during the installation of the Maximo Asset Management component, that a user has the appropriate security group permissions to log in to the Maximo Anywhere apps after the installation of the product is completed. Enable the Anywhere Administration capability so that you can modify the apps from Maximo Asset Management by using the Anywhere Administration application. Enable demonstration mode in the Anywhere Administration app to ensure that any user has end-to-end connectivity with limited data that is established from the device. The Anywhere Administration app properties to set to true are Si.demomode and Si.demopagesize. Run the build all command and the admin-config-loader.xml utility from the launchpad after the installation is complete. Budget Monitoring in IBM Maximo? In the Budget Monitoring application, you can create budget records to monitor transactions in a financial period. Monitoring budget costs can help to ensure that projects or activities, such as work orders, are completed within an agreed budget and can improve estimation of the costs of future projects. As an administrator, you can create budget records by configuring focal points and calculation rules. Focal points represent the item that you are monitoring in the budget record, such as assets, location, or general ledger accounts or components. You create focal points, for example, to track costs on check type master task cards for a specific model of aircraft. You can configure calculation rules that are based on estimated, approved, and actual costs. Users create transactions for work orders, purchase requisitions, purchase orders, receipts, invoices, and issues. The budget records then monitor these transactions and are used to create reports. Budget reports provide a summarized and detailed view of costs by type, such as labor, tools, services, materials. Budget reports also provide a summarized and detailed view of costs by status such as estimated, approved, and actual costs, and compare them with related budgeted amounts. Maximo Health, Safety and Environment (HSE) Manager is an organization-wide platform that integrates health, safety and environment processes with work and asset management. This enterprise asset management add on solution provides a central application for reporting all incidents spanning work, personnel, safety, health and environmental areas. Maximo HSE Manager has full management of change process capabilities. Its non-conformance management capabilities can manage non-conforming engineering specifications, materials, components, parts and processes. Maximo Asset Management Scheduler is an end-to-end work management tool for Maximo Asset Management. It allows planners and schedulers to view all work orders and preventive maintenance schedules graphically on a Gantt chart. Plan, schedule, dispatch and track all work from your enterprise asset management system. Dispatchers can locate and track their field resources on a public map and can manage emergency work – while staying in touch with field resources. Optimization models help gain significant efficiencies by automating work management tasks. Intuitive visual navigation through work orders and tasks. Task and work dependencies management. Manual or automated resource or crew assignment and dispatching. Maximo Calibration is used to calibrate tools and measurement equipment and standards. It is a fully integrated part of Maximo Asset Management and helps to optimize the quality of products produced. The enterprise asset management add on solution provides all the needed requirements for traceability and reverse traceability, all calibration history data, calibration data sheets and required reporting. Maximo Spatial Asset Management allows users to view complex GIS information inside the IBM enterprise asset management solution. It provides a geospatial context of work, assets and relevant land-based features. The ability to visualize information can improve reliability, longevity and efficient work execution. A seamless user experience with dynamic GIS functionality – instead of simply viewing a static map. Alignment with specific business needs and improved work planning and analysis – while eliminating the need for data duplication. GIS functionality inside Maximo to create efficiencies in business processes and improves communication. Ability to access data that is not maintained in an organization’s GIS systems – which can provide valuable insights for decision making. A solution built on the latest Esri ArcGIS Server technology.